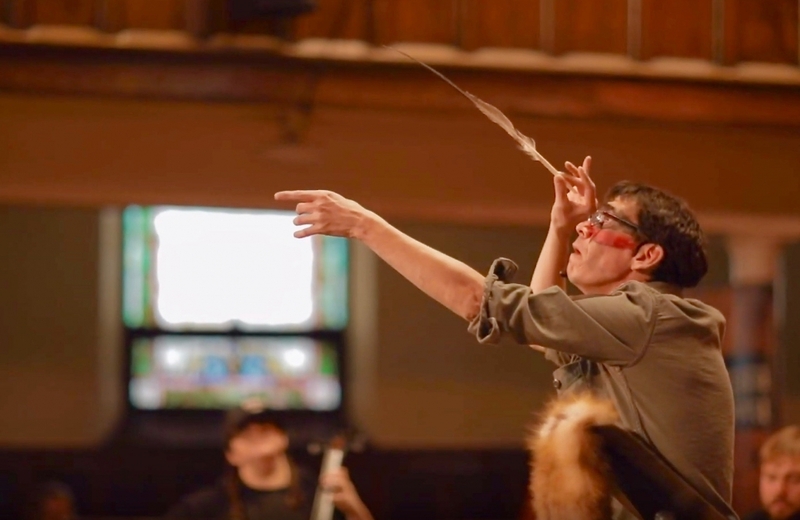 This past November 2018, Camerata Nova performed Fallen, the second concert in our Truth and Reconciliation series. Here’s what Camerata Nova’s Artistic Director, and Fallen composer, Andrew Balfour, had to say about it. About three years ago, I became fascinated with the idea of marking the 100th anniversary of the end of World War I with a mini-opera on the founding of the 107th Timber Wolf Battalion in 1915. It’s an amazing story about 1000 men, half settler and half indigenous, who fought together in some of the most famous battles of the Great War. At the same time as this was percolating, Camerata Nova decided to create a Truth and Reconciliation concert series, lasting over a number of years. Each concert has a theme that resonates with Canadian indigenous experience and, over the series, we are inviting a range of incredible indigenous artists to collaborate with us. Our first T&R concert was Taken, performed in Winnipeg and Ottawa in 2017, featuring Cree hip hop artist Lindsay Knight (Eekwol) and recent Polaris winner Jeremy Dutcher. Fallen is our second. It has evolved in a fascinating way. On one hand, I have been delving into the other-world, terrifying experiences that Cree and Ojibway warriors in the Timber Wolves must have experienced in WWI, having no idea what it meant to enlist or why or how they came to be in the midst of the mud and gas in Europe. On the other hand, as I read literature and poetry from ordinary individuals in Europe at the time, I was also deeply touched by the profound helplessness and sadness they felt as their sons, brothers – and themselves – fell victim to such prolonged, useless and outrageous slaughter. Fallen is a deeply felt anti-war concert, not just focussed on “the war to end all wars” but on those before, those after and, tragically, on the wars yet to come. There is no better way to open this concert than with a traditional Prayer Song from Ojibway friend and Song Keeper, Cory Campbell. He performs with a straightforward purity, humility and strength that grounds and guides me as I straddle settler and indigenous worlds. Thank you, Cory, for your openness, your help with language and the example you set for how I should approach my music and my life. Notinikew: I wrote this work over the summer while I was in St. John’s Newfoundland, then Toronto, then Temagami in Northern Ontario and, finally, in the Herdsman House Artist Retreat in Neubergthal, south of Winnipeg. It’s been quite a journey – in all senses. My original idea was to write a partly fictional mini opera about the story of the Timber Wolves, but this morphed into a more abstract choral drama. 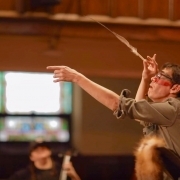 Scored for adult choir, treble choir, baritone solo/performance artist, cello and traditional drummer-singer, Notinikew is an anti-war piece, an indigenous identity piece – a tragedy that speaks not just about World War I, but all wars and all indigenous soldiers. Notinikew was difficult to write but also magical and important. It is an honour to try, in my own way, to tell the stories of our people. In addition to Cory, my guide and compass, I want to thank Cris Derksen who is so talented and creative – this collaboration has been so much fun, and I think it’s just the start… Also, I could not do these ambitious projects without Mel Braun. He “gets” me and what we are trying to do and has respect for all around him. He is not afraid of experimentation and undefined elements and magically, calmly pulls it all together.